ISTANBUL: A prominent Saudi journalist critical of Riyadh was still missing on Wednesday 24 hours after he entered the kingdom’s consulate in Istanbul, with his fiancée anxiously waiting for news and US officials investigating his case. Jamal Khashoggi, who writes opinion pieces for The Washington Post, has not been seen since entering the Saudi consulate building on Tuesday where he was to receive an official document for the couple’s marriage. Khashoggi, a former government adviser who went into self-imposed exile in the United States last year to avoid possible arrest, has been critical of some policies of Saudi Crown Prince Mohammed bin Salman and Riyadh’s intervention in the war in Yemen. A senior Turkish official said the Saudi journalist was still being held at the consulate. “According to in­­formation we have, this individual who is a Saudi nat­i­o­nal is still at the Istanbul consulate of Saudi Arabia,” presidential spokesman Ibra­­­­him Kalin told a news conference. He said the Turkish foreign ministry and police were closely monitoring the case, adding that Ankara was in touch with Saudi officials. “I hope it will be resolved peacefully,” he said. Khashoggi’s Turkish fiancée has been waiting outside the consulate since Wednesday morning. “I haven’t received any news from him since 1pm (1000 GMT) on Tuesday,” said 36-year-old Hatice, as she stood outside the barricades around the building. She said Khashoggi had gone to the consulate to obtain documents for their own marriage to prove he was not married. 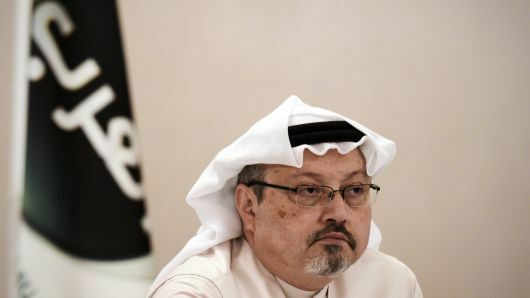 Khashoggi is one of the rare Saudi journalists to raise his voice against repression in the country. In one of his last tweets, he criticised the lawsuit filed against a Saudi economist, Essam al-Zamel, after his arrest by Saudi authorities. Be careful Pakistan. These are not rational actors. Vigilance when dealing with this regime. Probably already shipped out of Istanbul in a diplomatic bag and now in some Saudi jail, being interrogated and tortured. That;s how the Saudis operate. They did the same to some very prominent and wealthiest Saudis at the tony Ritz Carlton Hotel in Riyadh who were only deprived of their wealth to the tune of some $100 billion. Wherea this guy is a very vocal critic of the Saudi Crown Prince and a writes for US media, Imagine what they will do to him?? MBS cannot tolerate any dissent, so much for his rabid following of the WEST! Like Trump, his name will remain in infamy.